It is important to exercise as well as develop good eating habits when dieting. However, exercising does not work to reduce weight. For example, walking for 30 minutes is almost equal to burning the calories for one banana. 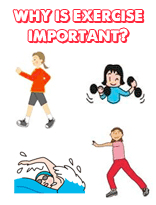 Nevertheless, exercise is a very important element of any diet plan. Some research was conducted on measuring the effects of dieting without exercise and dieting with exercise. It was found that those who dieted while exercising were able to reduce their body fat more easily. In other words, exercising reduces your body fat percentage.In contrast, if you do not exercise while dieting, you might lose some of your muscle mass. If you regain your weight, you will end up with a higher body fat percentage.Let’s work towards keeping a good figure! If you would like to learn more, please contact us.